Kettlewell is a lively village situated below Great Whernside and Buckden Pike and beside the River Wharfe in Upper Wharfedale. The village is said to be Anglo Saxon taking its name from Chetelewelle meaning bubbling spring or stream. To the south of the village, signs of Anglo Saxon farming can still be seen in the terraced fields. The village became a thriving community after a market was established in the 13th century textiles being the main industry but in the late 18th and early 19th centuries lead mining had a big influence on the village and today some of the houses and the vicarage date back to the latter period but the Church of St. Mary is late Victorian. The remains of the smelting mill can be seen near the meeting of the Rivers Cam and Dowber Becks about half a mile above the village. Kettlewell is very popular with tourists and walkers, who can easily access Great Whernside and Buckden Pike via Top Mere Road, and the village houses three pubs, cafe, post office, village store, caravan and camp site, youth hostel and many guest houses and holiday cottages. For years Kettlewell and Top Mere Road was the scene in the opening credits of Emmerdale and Kettlewell was also the location used to represent the village of Knapely in the 2003 film Calendar Girls. A Calendar Girls Trail brochure giving information about local landmarks and buildings used in many of the scenes can be purchased from local shops and pubs. In August Kettlewell holds an annual scarecrow festival where a variety of scarecrows dressed up as different characters are placed around the village. Littondale is the dale of the River Skirfare and the villages of Hawswick, Arncliffe, Litton, Foxup and Halton Gill. 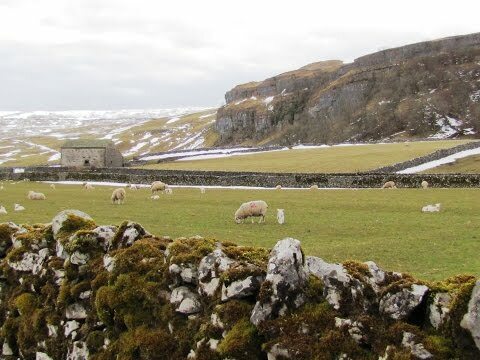 Littondale lying deep within the Yorkshires National Park and located to the west of Wharfedale is a peaceful and tranquil dale as the world passes by the end of the valley on the B6160, Skipton – Kettlewell road. This beautiful dale with its dry stone walled fields and rich green steep hillsides of open pasture and hanging woods, crested by craggy outcrops and exposed moorland is dotted with stone barns, some 17th century farmhouses and a number of shake holes and sink holes that lead to underground cave systems. The River Skirfare flows through Littondale for 9.5 miles from the confluence of Foxup Beck and Cosh Beck into the River Wharfe between Kettlewell and Conistone. At the head of the dale is Pen-y-ghent one of the Yorkshire Dales Three Peaks. The next hamlet is Arncliffe which lies at the confluence of Cowside Beck and the River Skirfare. It is the largest village in the dale its name derived from the Old English “earna-clif” meaning eagle’s cliff. The village, a conservation area, and its only pub are centred round its large village green where the yearly Fete is held. Behind the buildings are some small crofts, nearly one to each house and the lime stone walls beyond cover the hillsides like a patchwork quilt. The Falcon Inn, with accommodation, still serves its beer in the old fashion way from barrel to glass via a porcelain jug. Evening meals and breakfast are traditional home cooking and plenty of it. The Falcon also has four miles of its own private fly fishing on the River Skirfare. The lovely church of St. Oswald’s, situated by the River Skirfare, was built in the 16th and 18th centuries replacing the first stone church built in the 12th century. Arncliffe was the original setting for the fictional village of Beckindale in the TV soap Emmerdale Farm from 1972 until the relocation to Esholt and the Falcon Inn was featured in the soap as the Woolpack Inn. Litton with its tiny village green is the third hamlet its name meaning village on a roaring stream. Halton Gill, the dales fourth hamlet, its name derived from the Anglo Saxon “haugh” meaning Valley and “tun” meaning farm and gill an old Norse word meaning “ravine” therefore meaning “valley farm by the ravine”. The last hamlet in the dale is Foxup, meaning upstream with the foxes, and until recently the hamlet had three farms but only one remains it is also the source of the River Skirfare. We park in the car park then have wander around kettlewell before making our way to the bridge over the River Wharfe. Immediately after crossing the bridge we turn right and take the path on the left sign posted Moor End and Arncliffe. We pass through the gateway, head forwards then bear off left at the sign post heading uphill to the crags we see in the distance. We scramble to the top of the rocks then head forwards uphill following the grass path to a stile in the wall. We go over the stile and turn left following the wall for a short way then the path bears off to the right to some more crags which we go over and keep heading uphill to the top and a stile in the wall. We head forwards over the next wall then start going downhill heading towards Arncliffe and the River Skirfare in Littondale. We keep following the path round to the right to go through two gates until we come to a gate in the wall at a wood. We pass through the gate and go steeply downhill over some rocks and continue through the wood. When we come out into the open we keep heading downhill through a wall towards the River Skirfare and the road. We go over a stile, cross the road and follow the river on our left towards the bridge. We go over the stile and turn left over the bridge and left again towards the church. We have a quick look round Arncliffe then make our way back to the church and follow the footpath sign on the left between the buildings to come out into a field with the River Skirfare on our left. We keep heading forwards through the fields until we come to an iron bridge. We cross the bridge and turn left on the road for a short way into Hawkswick where we turn left at the sign post for Kettlewell 2 miles. We head forwards through two gates then turn right and keep following the path uphill. At a large cairn we walk forwards a little further and bear left round the end of the outcrop then uphill to cross over a ladder stile in the wall on the right. We head straight forwards then bear round to the left on the path then we take a small path on the right to go downhill to Kettlewell. When we reach the road we take the path that follows parallel to the road until we come out near the bridge at Kettlewell then make our way back over the bridge back to the car park. This is a hard walk at the beginning and the end with steep inclines and declines on good well walked footpaths and tracks. The middle section of the walk following the River Skirfare between Arncliffe and Hawkswick is much easier. Lowest Point 205.10 metres (673 feet) Highest Point 482.60 meters (1583 feet). Approx 6.25 miles allow 3 – 4 hours using OS Map OL30 Yorkshire Dales, Northern & Central Areas. Wensleydale, Swaledale.Start Point: Car Park in Kettlewell. Kettlewell is situated on the B6160 between Grassington and Aysgarth in Wharfedale in the Yorkshire Dales. From the A1 take the A61 to Ripon. At Ripon take the B6265 through Risplith and Pateley Bridge, past Hebden and Grassington. At the t-junction at Threshfield turn right onto the B6160. Pass-by Conistone and through Kilnsey and Kettlewell is another 3 miles. There is a pay and display car park, some road side parking and a small parking area opposite the garage charging £2 for all day payable at the garage. There are public toilets in Kettlewell next to the pay and display car park and also at nearby Buckden and Grassington. For refreshments there are two pubs, the Racehorses Hotel and the Blue Bell Inn, a tearooms and a shop/post office. A third pub the Kings Head has closed down recently. In Arncliffe there are no shops only a pub the Falcon Inn. In Buckden there is the Buck Inn and the Fox and Hounds at Starbotton. There are pubs, cafes and shops at nearby Grassington.